The students filing into Room 102 of the Pasquerilla Center on this Friday morning in early October come from Holy Cross, Saint Mary’s and Notre Dame. They take their seats among professors from each of the three schools and the cheerful greetings all around hint at the creation of a community. This is Sustainability at [Notre Dame] and in the Holy Cross Charism — the course title differs depending on where a student is enrolled — a two-credit, interdisciplinary, first-of-its-kind class that rotates from one campus to the next each week, giving students the chance to learn up close how each school manages its resources with an eye toward its moral responsibilities, present and future. Today’s class is part of the course’s energy unit. After a brief lecture on the University’s energy needs and its conservation efforts over the last 10 years, the plan is to head downstairs into the building’s basement and then over to the construction site near Stepan Center where workers are drilling the geothermal wells that will sit beneath the marching band’s future practice fields. Taught by six professors — their academic and campus affiliations include biology, theology, campus ministry, English and environmental studies — the course is the culmination of years of discussion about how to foster a deeper connection among the three Holy Cross schools and their institutional partners in the local community. To help them, Pfeil and her faculty partners divided the course into the three units of landscape, energy and food, weaving readings of Pope Francis’ 2015 encyclical letter Laudato Si’ and reflections on Holy Cross spirituality throughout the curriculum. During the landscape unit the class toured each campus, discussing rain gardens and the cultivation of native plants and biodiversity. The energy unit included an energy audit in a Holy Cross College dorm room and a discussion of Notre Dame’s power plant and brand-new geothermal investments. Later, in the food unit, the class meets with the Notre Dame dining hall staff for a behind-the-scenes look at how food reaches students. The course culminates in group projects through which students from each campus work together on an issue raised during the semester. This morning in the Pasquerilla Center, instructor Rachel Novick, the director of the sustainability minor at Notre Dame, begins with an overview of the University’s energy resources. 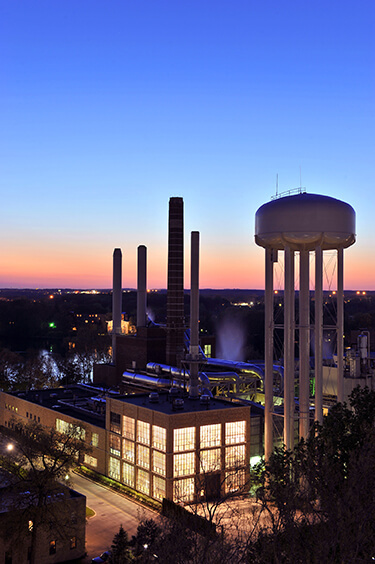 She describes the use of cogeneration at the power plant on Saint Joseph’s Lake, an efficient method for using the steam heat that is produced as a byproduct in the generation of electricity for campus. In addition to providing heat for our buildings, the technique provides about 50 percent of Notre Dame’s energy needs, Novick says, making production less expensive at the school than it is across the street at Holy Cross and Saint Mary’s, which buy all of their electricity off the grid. Discussing the balance of the university’s rapid growth and its carbon reduction efforts, Novick explains how Notre Dame structures its carbon reduction goals by the square foot — targeting a 50 percent reduction in 2005 emissions by 2030, according to the University’s sustainability strategy — to allow for future development. By contrast, many colleges and universities commit to fixed carbon goals. Bob Werner, a guest from Notre Dame’s Utilities Department, takes the floor for a deeper dive into the University’s energy conservation initiatives, which encompass everything from simple lightbulb upgrades to the more controversial set-point policy for thermostats. The policy saves energy by allowing room temperatures to fluctuate between 70 and 75 degrees — and draws complaints from those who miss their heating and cooling autonomy. The University determined that geothermal is its best investment for renewable energy, Werner says, describing three projects underway in 2016: the pilot project on East Quad, controlled from a retrofitted mechanical in the Pasquerilla Center basement, another geothermal field beneath a parking lot south of the football stadium and a third under the new Ricci Family Fields near Stepan. The East Quad field consists of 153 geothermal wells, hidden beneath pristine grass outside the new McCourtney Hall advanced research facility. Geothermal energy draws from the earth’s heat, using giant pumps to either store heat in the well field or extract it depending on what’s needed. It is “like a large refrigerator but it can operate in the reverse direction as well,” Werner tells the students. Electric compressors and refrigerant may eject the heat released from cooling water into the well field when providing air conditioning. In the winter, heat may be pulled back out to warm buildings. The systems are very efficient, but require a huge up-front financial investment. Lively conversations about energy use permeate the group as the class follows Werner over to the Ricci site. Along the way, Alicia Czarnecki, a Notre Dame senior studying environmental engineering, talks about how the course is opening her eyes to facets of campus she hadn’t thought about before. She says she appreciated the chance to hear other perspectives, especially students whose experiences are different from hers at Notre Dame. “It’s hard to talk about sustainability in isolation,” she says. Three weeks later, the themes of interconnectedness, awareness and difference across the campuses carry through to the discussion session that caps off the energy unit. The class uses the World Café Method for small-group discussions: Students change tables at random to converse with new people and instructors pause the conversations periodically to share ideas, themes and conclusions with the whole room. At the outset, Pfeil urges the class to adopt a reflective tone while three students take turns reading passages from Laudato Si’ and channeling Pope Francis into the conversation. Now the task is to examine how the ecological culture Pope Francis calls for relates to their three weeks of studying energy at the three Holy Cross schools. Upon each table is a copy of the “Family of Holy Cross Statement on Climate Change,” covering the collective environmental position of the sisters, brothers and priests of the religious community. Students mention the interaction between the environment, cultural traditions and individual action. They acknowledge current efforts to increase energy efficiency, while noting the room left for improvement, and explore the trade-off between immediate economic rewards and long-term environmental sustainability. As students and instructors mingle around the room, distributive justice — the call for an equitable distribution of resources — emerges as a prevalent concept, as does the threat that global warming disproportionately poses to the poor and the impact of choices made by colleges and universities. The students ask thought-provoking questions they might not have raised in other settings. Could Holy Cross College invest in a rain garden by taking a little funding from every student’s tuition? What if Notre Dame turned off the lights that illuminate Mary atop the Dome at night when few are out to see her? Energy efficiency is a common goal across campuses, but do we need to use that energy? Is it right to fly in dozens of speakers to our campus each year when the events are often under-attended? Is it better to use sheets of paper rather than electronics in classrooms or to save the paper and use energy-demanding laptops and tablets? What about a student survey to ask what changes they’d be willing to make in the name of sustainability? The student reports reveal consensus and novel insights. Some discuss the merits — or shortcomings — of Notre Dame’s recently announced goal of being 25 percent renewable by 2050. Given the line in the Holy Cross statement that commits to urging government and industry “to adopt policies that successfully mitigate climate change and reduce its impacts on those most vulnerable,” many feel Notre Dame itself is failing to do so. As they ponder the reasoning and solutions, the room feels energized by a call to action — for each student to seek answers and be a solution. Natalie Ambrosio, an environmental science and journalism student from Sebastopol, California, is this magazine’s autumn intern. Originally published by Natalie Ambrosio ’17 at magazine.nd.edu on December 06, 2016.